A total of more than 80100 items in stock. We ship goods ordered until 11 oclock the same day. When purchasing over 50 EUR - free of charge. Goods in stock shipped no later than the next business day. You have 21 days for exchanging goods. 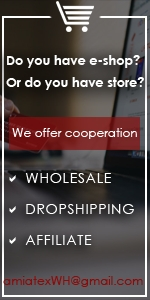 Free shipping for orders over 50 EUR. Regular discounts for loyal customers.